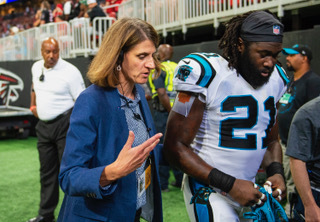 September 26, 2018 (Charlotte, NC)— Nancy Gritter, M.D., started her new role as lead internist of the Carolina Panthers, making her the first woman to serve as the lead internist on a National Football League (NFL) team. “Dr. Gritter combines professionalism, a strong work ethic, and a unique perspective on sports medicine,” said Dr. Robert A. Heyer, retiring as lead internist for the Carolina Panthers but continuing as a team physician. Dr. Gritter has worked with the Carolina Panthers since 2005, when she performed her first consultation for a player. Dr. Gritter’s specialties include internal medicine and nephrology. She is board certified with the American Board of Internal Medicine in both internal medicine and Nephrology, and she completed her primary care sports medicine fellowship at Atrium Health in Charlotte, NC in 2018, which earned her the certificate of the added qualification in Sports Medicine. Dr. Gritter attended medical school at Indiana University, and conducted her internship, residency and fellowship at Vanderbilt University. Dr. Robert A. Heyer, who has been the lead internist for the Panthers since the team’s inception in 1994, and is the immediate past president of the NFLPS, will continue to serve as a team physician, while Dr. Patrick M. Connor, orthopedic surgeon, will continue to serve as the head team physician. The NFL Physicians Society was founded in 1966. Its mission is to provide excellence in the medical and surgical care of the athletes in the National Football League and to provide direction and support for the athletic trainers in charge of the care for these athletes. For more information, please visit www.nflps.org. For use of the above photo of Dr. Gritter, please credit Melissa Melvin-Rodriguez/Carolina Panthers.